The basic concept of Flexo was widely accepted, and many brick builders found it an elegant solution to a problem they had long wanted to solve. Two successful Kickstarter campaigns showed us that much at least. But when it came time to move things to the next level, there was a lot to consider. And that’s where Mark’s son James steps in. James is the resident designer here at Flexo HQ (a title he humbly resists), and it wasn’t long before he had added to the Turtle, with a Seahorse, Stingray, and Crab evolving into four of the five creatures. 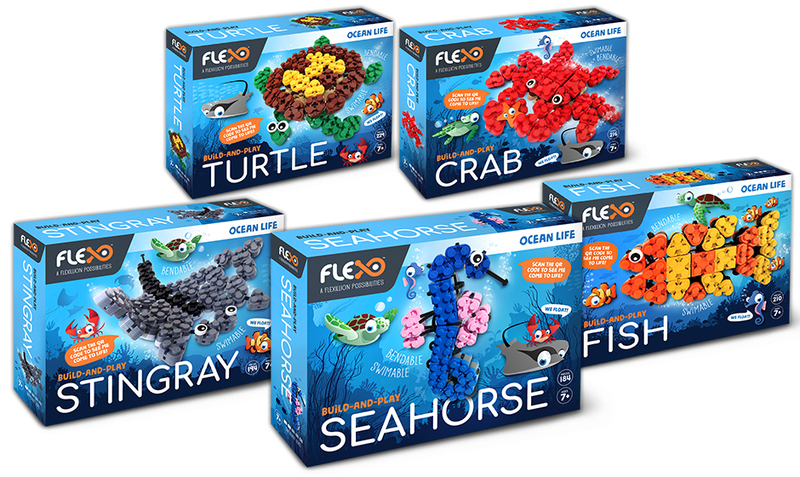 The Fish came later, the brain-child of another family member, and the Ocean Friends we now know as the Ocean Life Series – Flexo’s first foray into the world of pre-designed model builds – was born. Getting these boxed up and ready-to-sell was a conundrum in itself, but it was how best to present the instructions to customers and in what format that led to a brave step by the team: leaving traditional instructions out of the box. “If we were going to present a 2D paper version of how to do the 180-degree bend technique on the Fish head, for example,” Mark explains, “then the instructions would’ve been 50 pages long.” Instead we decided that the only way to truly show the techniques was via video, and YouTube became the focus of how to deliver them. The proof is in the watching! Head on over to YouTube, subscribe, and see for yourself! And don’t forget to comment – we just love hearing from you all. Which Ocean Friend is your favourite? Video build guides are fantastic! Very easy to follow and make building a joy, my favorite ion the Ocean Life series (sop far) is the Crab (I have yet to build some of the others). My overall favorite is the spider, it just has a character of of its own and is a fantastic design. Now I have to plan on stocking up with more bricks, I see an Flexpert kit in my future and I’m really keen on the GID tendons but wonder what I’m going to do with 7 other sheets of clear tendons as I already have so many – is there any scope to swap out the clear tendons for coloured?